Hamburg - When you’re marooned in the bottom two, counterattacking masters Borussia Dortmund are one of the last sides any team in such a perilous position would want to face. Hypothetically-speaking it’s a portentous scenario, yet it’s one that Hamburger SV found themselves tackling head-on last weekend. Nursing a seven-match losing streak and having relieved head coach Bert van Marwijk of his duties six days earlier, few gave the Bundesliga's only ever-present club a cat in hell’s chance of derailing a BVB outfit fighting tooth-and-nail for second place in the standings. The naysayers, however, failed to factor in the potential impact of saviour-in-the-making Mirko Slomka. The 46-year-old had only been in the managerial hot seat at his new club for around 120 hours prior to kick-off at the deflated Imtech Arena on Matchday 22, but that was all the time the former Hannover 96 tactician needed to transform the spirits aboard the embattled northern ship. The Hildesheim native’s first port of call was to shore up a back four that had shipped at least three goals in each of their last eight games in all competitions. Only Marcell Jansen and Heiko Westermann remained from the Matchday 21 defeat at Eintracht Braunschweig, with Slomka’s new centre-half pairing of Johan Djourou and Slobodan Rajkovic providing the unshakeable foundation to a stirring 3-0 win. 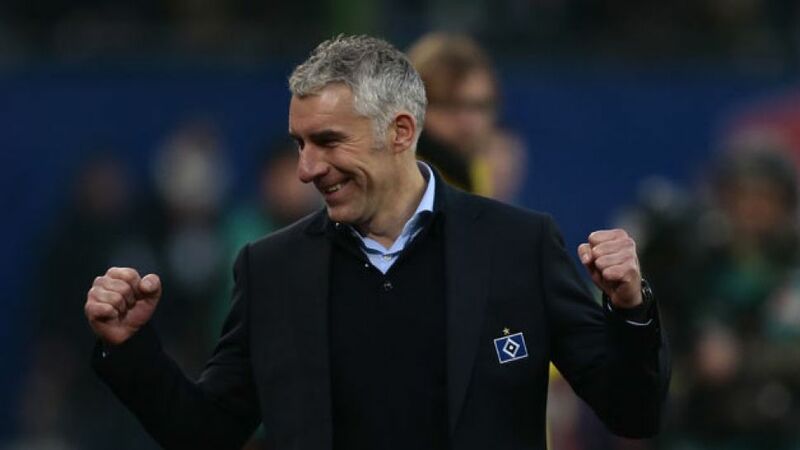 The Hamburg midfield, meanwhile, was virtually unrecognizable compared to the side van Marwijk put out in his final game in charge a week earlier. Tolgay Arslan and Milan Badelj added meat to the aforementioned defensive bones, while Petr Jiracek and Tomas Rincon thrived on the flanks, allowing Hakan Calhanoglu enough space to express himself behind lone striker Pierre-Michel Lasogga. The end product was nip-tuck surgery at its finest. After Jiracek feasted on his first goal of the season, Messrs Lasogga and Calhanoglu added the proverbial icing to the cake late on, with the latter surely doing enough to earn a place in HSV folklore with a sensational dead-ball effort that punctuated a rousing team display the likes of which the partisan home crowd had scarcely witnessed under Slomka's predecessor. “The coach has improved us all,” a re-energised Djourou explained. “The fans here are crazy about football, much more so than in England. The atmosphere is something else. I really want to stay at the club.” Assuming his former Hannover mentor fulfils his relegation-dodging remit as he did in the Lower Saxony capital during the second half of the 2009/10 campaign, the Arsenal FC loanee might well get his wish.